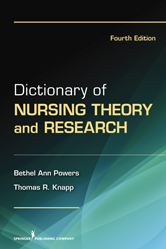 The fourth edition of this classic dictionary for understanding traditional and new concepts in nursing theory and research encompasses the considerable changes that have occurred in the clinical health sciences since the previous edition was published. It includes updates and new references for entries from the previous edition, and information related to developing areas of research and practice. New content that reflects nursing priorities in research and theory development in the current interprofessional health care environment is featured. This book remains an invaluable reference for nursing students, researchers, theoreticians, and scholars.